1. What type of gas do I need for my forklift? Forklifts in most cases run on LPG (Liquid Petroleum Gas). Forklifts that run on gas must have a compliance plate displaying when the system was tested and who by. This compliance plate will identify the type of gas the unit should be using. The other type of gas that forklifts use is CNG (Compressed Natural Gas). LPG cylinders are removable from the unit and in special cases are delivered full on an exchange basis. Please note; these cylinders can not be filled at the pump at service stations. 2. Are there diesel powered forklifts? Yes, diesel powered forklifts are available. 3. Are there forklifts that can be powered by petrol and LPG? Petrol powered forklifts can be converted to run on both LPG and petrol. This installation has to be carried out by a licensed LPG mechanic. 4. How long would the gas in a 15kg LPG forklift cylinder last? Many factors have to be considered when estimating the rate of fuel consumption. This includes the size of the machine, the engine size and the terrain the unit is being operated on. A rough guideline, a standard 2500kg forklift will get between 4.5 to 6 hours from a standard cylinder. 5. Can I rent to buy a forklift? Lencrow offer a variety of finance options and hire to buy is available. 6. Can I hire a forklift with a driver? Yes, we have fully licensed and qualified forklift operators available for hire at hourly rates. Contact us for more details. 7. What is the shortest time I can hire a forklift for? We hire forklifts from a minimum of 1 hour with an operator. If you would like to hire a forklift with out an operator the minimum is 1 day hire. 8. How often does my forklift need to be serviced? As recommended by the manufacturers, new forklifts will need to be serviced every 200-250 hours and this will be influenced by the work and site conditions. For machines that aren’t being operated regularly it is recommended that they have a safety check every 3-6 months. Regular services save both time and money by reducing downtime and repairing problems before they cause damage to other parts of the unit or cause safety issues. 9. What type of forklift do I need to unload a container? There are a variety of container entry forklifts available. These units are fitted with a mast that allows the forklift to lift without raising the forklift to lift without raising the units overall height. This lift height it limited but still allows stacking and unloading within a shipping container. These units are also ideal to use on sites with limited headroom. 10. How do I drive my forklift into a container? Container ramps/Access ramps are required to drive into a container when using a forklift or walkie stacker. The ramp you would need depends on whether the container is on the ground or on the back of the truck. We have ground level ramps available for short term hire. 11. Do I need to be trained to operate a forklift? Yes, a forklift specific license is required to operate any unit that you ride on and lifts more than 200mm. Order pickers and boom types require a different license. These licenses can be obtained by undertaking a registered training program and being assessed by an approved assessor. For an operator to use a pedestrian unit you must be instructed by a competent person. All units come equipped with an operation manual and it is recommended this is read prior to operating any machine. 12. What is the largest forklift available? 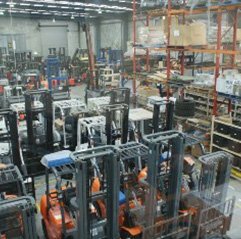 Forklifts are available up to 75,000kg and lift to heights of 15 metres. 13. How will the forklift be transported to my work site? Lencrow tilt tray trucks can deliver most sized forklifts. Please contact us for more information. 14. Can a forklift be used in the rain? Yes, fuel powered forklifts will, in most cases, can be used in wet conditions but you would need to be more cautious. Electric fork lifts in most cases are not suitable for wet conditions. 15. Can I fit attachments on to my forklift? Yes attachments can be fitted to forklifts. The attachment has to be suitable to the machine and display a rating plate. 16. Can I put slippers on rotators? Yes, as long as the machine is rated to use slippers. Any attachment that can be used on a unit must display a rating plate. 17. What forklift can be used in a confined space? Due to fumes generated by internal combustion forklifts, it is recommended to use electric forklifts in confined spaces. Prior to use, you must check with the person in charge of the confined space for equipment types that can be used in the site. 1. Do I need a gas or electric forklift? The choice of unit requires many things to be considered. A definitive answer can not be provided with out assessing the site conditions and understanding how the unit will be required to perform. 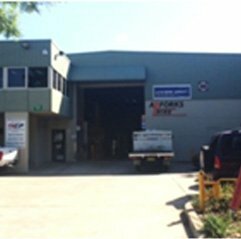 Call us today to discuss your unit requirements. 2. Can I use a car battery in an electric forklift? No, the construction of a car battery is not suitable for use in forklifts. Forklift batteries are deep cycle, this allows the batteries to be discharged and recharged many times through out its life. 3. Can I use an electric forklift in wet conditions? No, most electric forklifts are not designed for use in wet weather. 4. Can an electric forklift be used to enter a container? Yes, most models are suitable for container entry. 5. Can I hire a traction battery? Yes, traction batteries can be hired. Most hire terms include a charger and maintenance. Call us for more details. 6. What type of power supply do I need to charge an electric forklift? The charger required will depend on the size of the battery and this will determine the power supply that is needed. Chargers operate from mains power and the size will be dependent on whether it is single or three phase. 7. Can I get finance for a forklift? Yes, Lencrow have different finance options available on forklift sales. Call our sales team today to find out more details. 8. How fast does an electric forklift drive? The performance of an electric forklift is similar to that of an engine powered unit. 9. How do I charge an electric forklift? Electric forklifts are powered by deep cycle batteries and can be recharged with a compatible battery charger that is powered from mains power. 10. How high can a forklift reach? Taking into account the weight of the load being lifted, the heavier the load means the lower the lift. Various forklifts can lift between 3000mm & 10000mm dependent on your needs. 11. What is the biggest electric forklift you can get? 25 tonne lifting capacity is the largest forklift that is currently available. 1. Do I need a license to operate a pedestrian forklift? No, however the operator must have an orientation with each unit by a competent operator. 2. What speed does a pedestrian forklift operate at? 3. How is a pedestrian forklift powered? Pedestrian forklifts are battery powered and come equipped with charger plugs in to mains power supply. 4. How can I get a pedestrian forklift transported to my premises? Lencrow Group have tilt tray trucks that can easily transport a pedestrian forklift to your site. 5. How much can I lift with a pedestrian forklift? Pedestrian forklifts come in lift capacities up to 2 tonnes. 6. How old do I have to be operate a pedestrian forklift? There is no minimum age to operate a pedestrian forklift. The person must be deemed competent & have completed sufficient training on the unit. The site operator is responsible for training and appointment of suitable persons. 7. Can I operate a pedestrian forklift in the back of a truck? Yes, you can operate a pedestrian forklift or pallet jack in the back of a truck as long as the truck has the capacity to support the unit plus the load. The trucks floor surface must be able to support the load. Caution must be exercised ensuring that suitable guards or restraints are in place to stop the unit from falling off the truck. The unit handbrake must be applied and wheels chocked. 8. Can a pedestrian forklift drive up a hill? Yes it can, depending on the grade of the hill. Check the manufacturer’s specifications for each unit. 9. How high will a pedestrian forklift lift? Pedestrian forklifts can lift to heights of 6000mm. In most cases they are limited to 4500mm as this height allows the highest lift with the least amount lift capacity deration. Always check the manufacturer’s specifications unit information. 10. Can I drive a pedestrian forklift on grass? No, pedestrian units are designed to be used on concrete surfaces only. 1. How is a rough terrain forklift powered? Most rough terrain forklifts are diesel powered. 2. Can I operate a rough terrain forklift in sand? Yes, rough terrain forklifts can be operated in sand. Caution must be exercised when considering the capacities shown on the rating plates as they are applicable to hard level surfaces – capacity and lift heights may change due to surface. Consult the operations manual for capacity instructions in these conditions. 3. Can I operate a rough terrain vehicle in mud? Yes, rough terrain forklifts can be operated in mud. Caution must be exercised when considering the capacities shown on the rating plates as they are applicable to hard level surfaces – capacity and lift heights may change due to surface. Consult the operations manual for capacity instructions in these conditions. 4. Do I have to wear a seatbelt when operating a forklift? Yes, if the forklift has a seat belt fitted you must wear it. The law states that a seatbelt must be worn at all times when operating a forklift. 5. Do all forklifts have solid tyres? Forklift tyres can be fitted with either solid or pneumatic tyres. The tyre type will be dependent on the application and surface it is working on. Contact the Lencrow Services department for further information. 6. Can I put holes in the tines for towing? No, forklift tines can not be modified from the manufacturers specifications as this may weaken the integrity of the tines. 7. Can I use the forklift to push or pull another object? No, forklifts are designed to lift and move objects. Pushing and pulling objects will cause damage to the objects. 8. Do I need a license to operate a forklift? Yes, the law states that you must hold a current forklift license to operate a unit. 9. Can I hire an operator when I hire a rough terrain forklift? Yes, we have fully licensed and qualified forklift operators available for hire at hourly rates. Contact Lencrow for more details. 10. Are all rough terrain vehicles 4WD? No, some models are available in 2WD as well. 11. Can I fit an attachment to a forklift telescopic boom? Telescopic booms must be rated to have an attachment fitted. A rating plate is supplied by the manufacturer of the attachment and must be fitted on each type of attachment you use on a specific forklift.